1. What’s Magconn Technology? Tell me briefly. Magconn is a conductive wireless charging and data sync technology with an automatically pinpointing magnetic connection capability and it’s currently 100% compatible with USB2.0. 2. Magconn may have some advantages over other inductive wireless charging technologies like QI and PMA. What are they? Yes, Magconn has some comparative advantages over other wireless charging technologies like Qi and PMA. Not like them, Magconn has the data sync function in addition to the power charging as well. You will face no heating issue thanks to its much higher charging efficiency. It obviously has no harmful electromagnetic radiation and you will be able to enjoy lower costs less than half against inductive charging. The feature also provides higher security with no hacking and ensures quick charging as well. 3. Is there any heating issue of the products using Magconn Technology? NO Heating issue due to the excellent charging efficiency (97-99%): not like Qi or PMA (Inductive wireless charging), Magconn is a conductive magnetic wireless charging technology which has almost no energy loss during charging. 4. What is the price range of the Magconn modules? It is at a reasonable price currently less than half the price of Qi and PMA. 5. I understand that wireless charging technologies are available out there. What kinds of merits Magconn users can have against them? 2. It has bundled capabilities of charging, data sync and OTG at the same time. 4. It’s compatible with the current and future USB connections. 5. It’s waterproof and easy to clean. 6. It has no breakage and malfunctioning issues due to sudden pulling of a cable. 7. It’s affordable in terms of costs. 6. What is the thickness of Magconn RX? Magconn offers two thicknesses of 1.2mm and 0.7mm. applications. 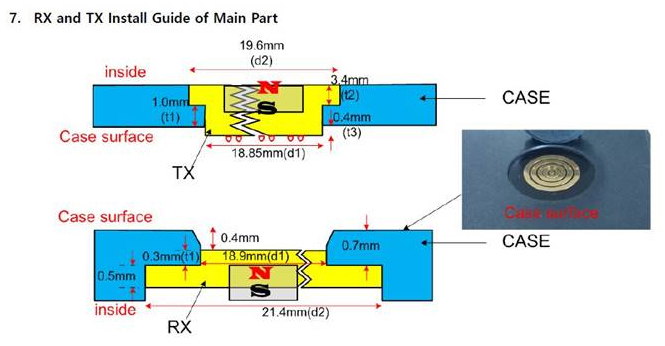 In order to build the solid connection between RX and TX, the bottom of RX is recommended to be 0.4mm lower than the product surface. 7. What is the diameter of RX? Magconn offers two different diameters of 18.9mm (standard RX) and 13.6mm (mini RX). 18.9mm RX is used for the applications which require 5~12V & 2.1~10A power rating. This 18.9 mm RX can be applied for a Quick Charging capability. 13.6mm RX is used for relatively small and compact products which require 5V & 1A power rating, such as wearable watches and VR glasses. 8. What happens when a metal makes a short on TX? 9. Is it short-circuit protected? 10. Could you let me know what standard Magconn modules are available to try? Brief specification may help before going for NDA as a next step. Here you are. You will be able to find the basic Magconn module table as follows. 11. How fast is the Magconn data transfer speed? It meets the USB2.0 standard (480Mbps) at the moment. According to the findings of our lab tests, Magconn is capable of 2Gbps. 12. Is there the technology roadmap? Yes, Magconn has the technology roadmap to share with customers. Please refer to Magconn Technology Roadmap for further information. 13. Does it meet the USB3.0/3.1 specifications? 14. Is Magconn RX waterproof and dustproof? 15. 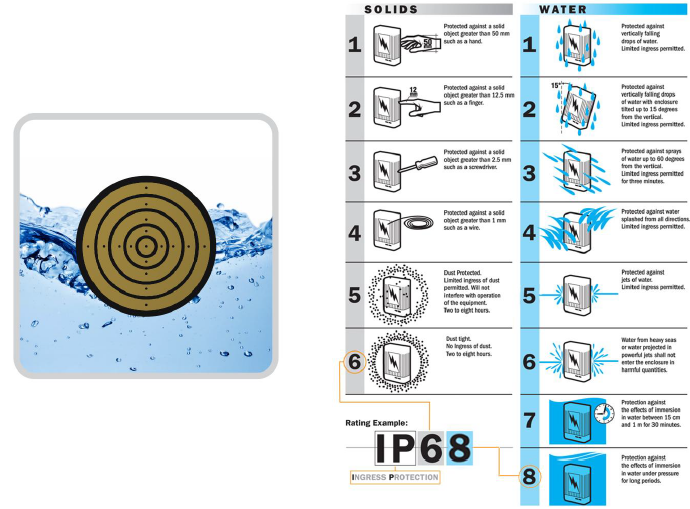 If Magconn is waterproof, what is the waterproof level? 16. Does magnet influence the devices? A metal shield plate is used to shield a magnetic influence on the device. It minimizes any influence on it. However, a compass can be influenced. * Some of the device manufacturers may say that their customers are recommended to refrain from using their products side by side with magnets. 17. Does a magnet influence credit cards? There are two types of credit cards which have magnetic stripes and IC chips. A magnet has no impact on IC. Also, the magnetic stripes have several different classes depending on the resisting magnetic fields. In case the magnet strip on a credit card is HI grade, it can resist against up to 2750 gauss. It means the credit card is safe from Magconn applications because the magnetic stripes of credit cards are HI grades. 18. Is a phone call affected by using Magconn? Smartphone communications are not affected. The communication interference test report will be provided upon NDA and request. 19. Are there any reliability test reports? Yes, Magconn has the comprehensive reliability test reports. The Magconn module should pass the internal test criteria to meet harsh applications such as power efficiency, data transmission speed, protection, Interference, durability, anti-corrosion, leakage current, skin effect, etc. To get the test reports, NDA is required. 20. Is it of anti-corrosion? Yes, it is anti-corrosive. Salt spray tests were taken and passed under standard KS D 9502 : 2009_48Hours. The anti-corrosion test report will be provided upon NDA and request. 21. Is there any risk of sparks by dusts (or fine dusts)? Magconn is safe from sparks unlike Pogo Pin. As Magconn RX has a flat structure and is waterproof/dustproof, dusts cannot go inside the devices. 22. Is there any impact on human skin in case RX surface touches skin? It is safe for human skin. The purity of RX gold ring is 99%, so it is better and safer than gold rings, gold watches, and gold accessories. Also, UL Test report will be provided upon NDA and request. 23. What are the CE (Consumer Electronics) products or industrial products using Magconn in the market? Yes, many CE or B to B products are already in the market. Please visit Magconn webpage (www.magconn.net) and see the partner section. For example, there are tablets, wearable watches, Outdoor winter jackets, RFID/Barcode readers, and smartphone accessories. The products using Magconn in the market are listed on the webpage (www.magconn.net) and more applications are under development. 24. Does Magconn have IPs (Intellectual Properties)? Yes, Magconn has a lot of IPs (patents, utilities, designs) worldwide including Korea, US, Japan, Europe and China. After NDA, we can provide key points of Magconn patents. 25. Can you match the color of a RX module with the one of a phone jacket or a smart device? Yes, we are going to supply with some color variations so that a device designer can easily consummate its design. 26. Is the charging efficiency decreasing during data transfer same time? Charging efficiency depends on power source and device. 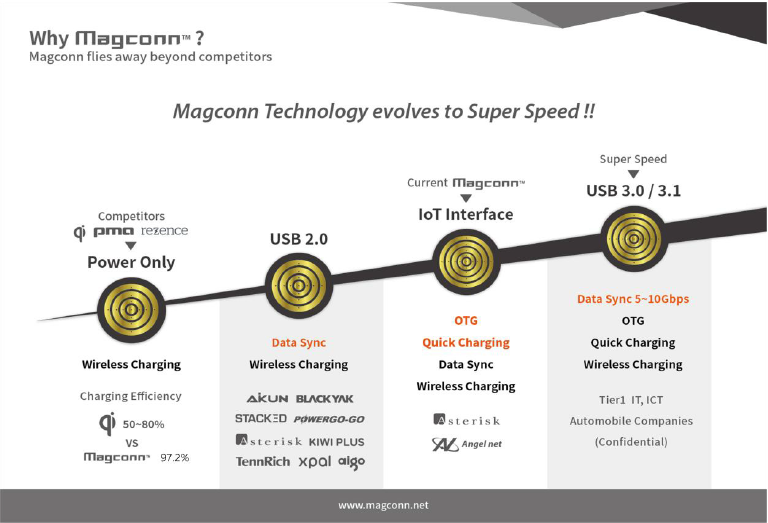 Magcaonn does not impact charging efficiency during data transfer same time. 27. Regarding the data transmission, Is there a regulation on the length of the cable?, How many meters@USB2.0 can be accommodated? 28. More than 10,000 attachment/detachment times is required, Is it possible to Magconn? 29. Do Magconn connectors have safety certification? We plan to apply and get UL in 2018. 30. 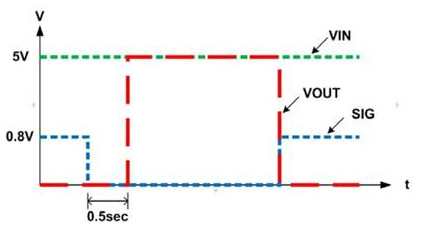 How to make sure to avoid arc discharge when Magconn RX and TX are connected and disconnected? 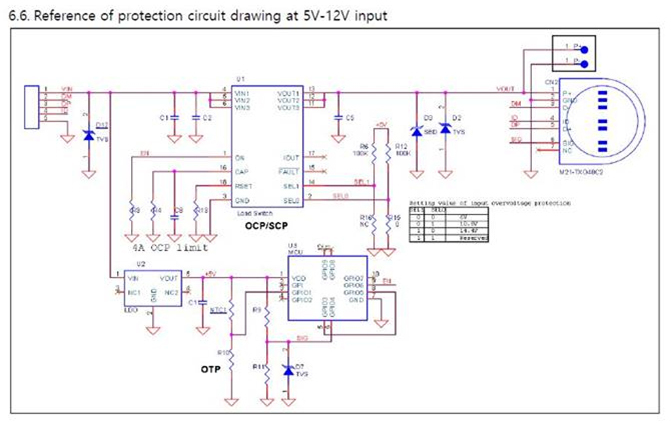 We have a short circuit protection in the TX PCBA. It is described at the 6.5 & 6.6 section in the M21O spec sheet. We suggest customers to follow the RX/TX installation guide as you can see the 7 section in the M21O spec sheet. TX connector is assembled 0.4mm higher than product case surface, and RX connector is assembled 0.4mm lower than product case surface to have more secure connection.